Knowing how to arrange flowers kind of sounds like a b.s. skill, like something they'd teach you in trophy-wife school. 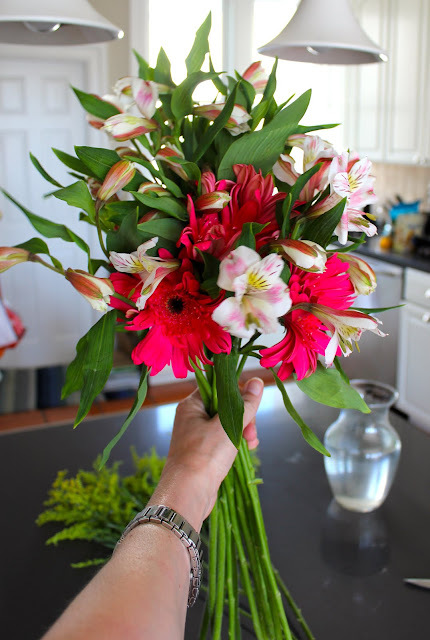 That said, after years of awkwardly throwing grocery-store bouquets into whatever vase I had lying around and then watching them die a quick death before my very eyes, last fall I took a flower-arranging class at Workshop SF and it was, to put it mildly, a life-altering experience. Since then, not only do I treat myself to flowers, I do it with $12–$16 in Trader Joe's stems (that's the cost of one cocktail at a fancy bar, people!) and make them last up to two weeks. Here's how. I love Trader Joe's because their flowers are incredibly reasonable, but feel free to go to your local grocery store or flower market. You want to vary the size and texture of what you choose, and aim for a unifying color scheme. 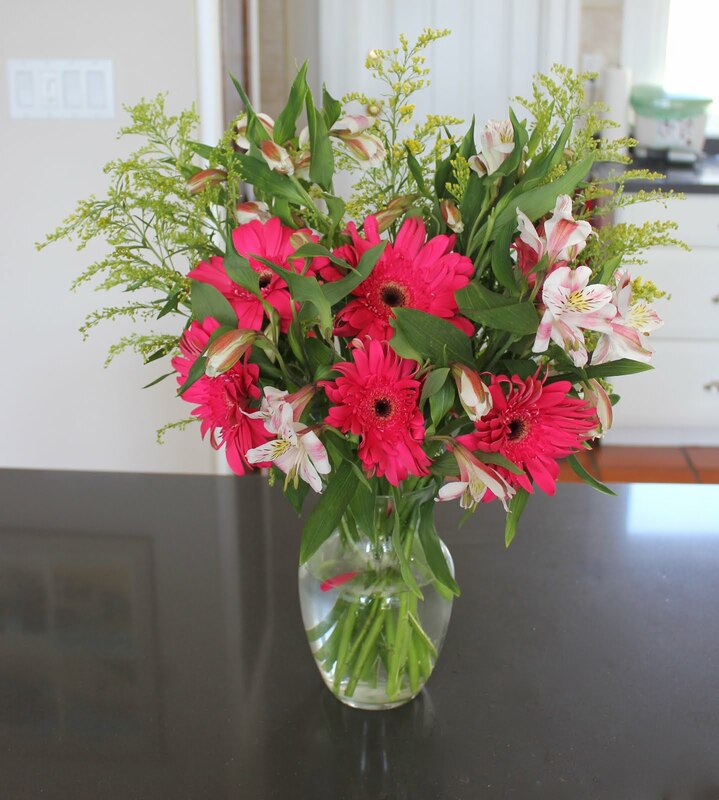 Here, I picked full gerber daisies in a bright pink, smaller lilies in light pink and white, and a green wispy spray to add in a little texture. Bonus tip: if you're clueless about colors, go with all white—it always looks classy. 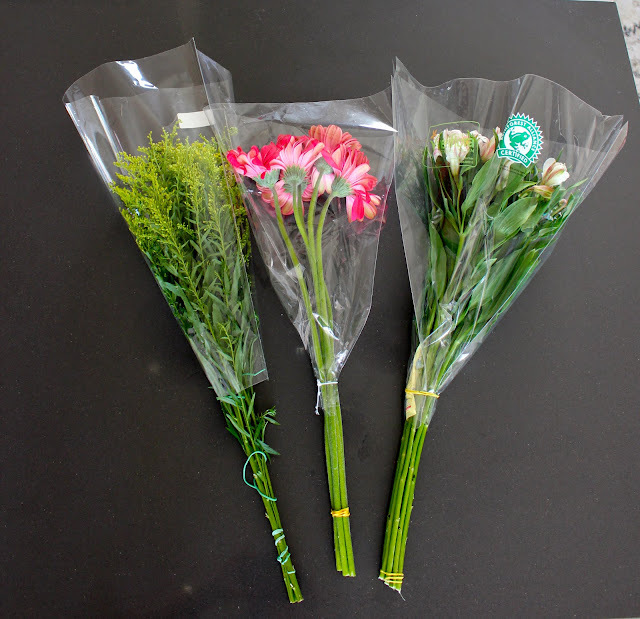 This is the MOST IMPORTANT step if you want your flowers to last longer than a couple days. It's annoying, but it's worth it in the long run. 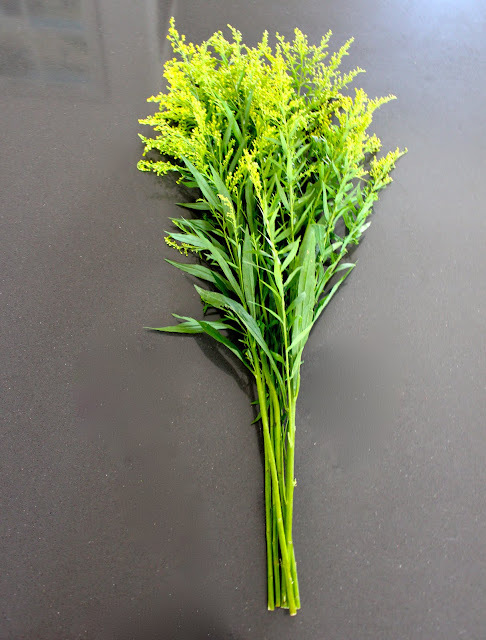 You want to strip all of the tiny leaves from the stems, up to the neck of the blooms—really, you just want the leaves to peek out of the top of the vase. Don't worry about taking off too many leaves. Trust me, you DO NOT want leaves in the water; this is what makes the stems rot and your flowers die. This was seriously the most important thing I learned in my class! Start with your biggest blooms. Then add in the next-biggest around the edges. You want to vary the height and placement, so it's not totally symmetrical. You can kind of wrap and twist the smaller flowers around the bigger ones to achieve this. Finally, layer in the smallest blooms. If you have something leafy, that's great for propping up the larger flowers. Just play around with it and have fun! Take the vase you're going to use, fill it up with water (about 3/4 of the way), and put it toward the edge of your countertop or table. Then, with the flowers in your hand, hold them next to the vase with the bottom edge of the blossoms lining up with the opening (again, your stems should have NO LEAVES on the stalks). Eyeball how much stem is sticking out under the base of the vase—this is how much you should trim—and note it will probably be different for each. Cut at a slight angle, and remember you can always trim more if your stems are still too tall. 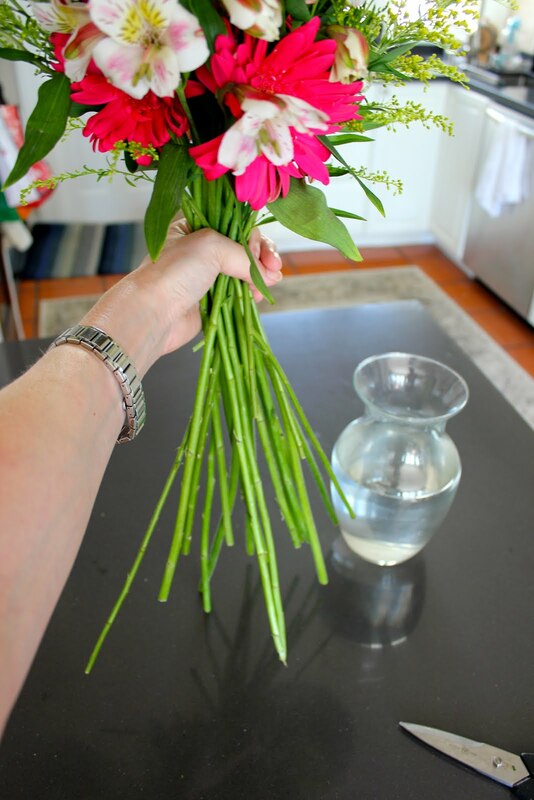 All you have to do is drop them in the vase and you're done! Just kidding. Your vase probably has a slightly wider opening than your hand, so you might have to do a little re-arranging once you get them in there. But really, you're pretty much done. 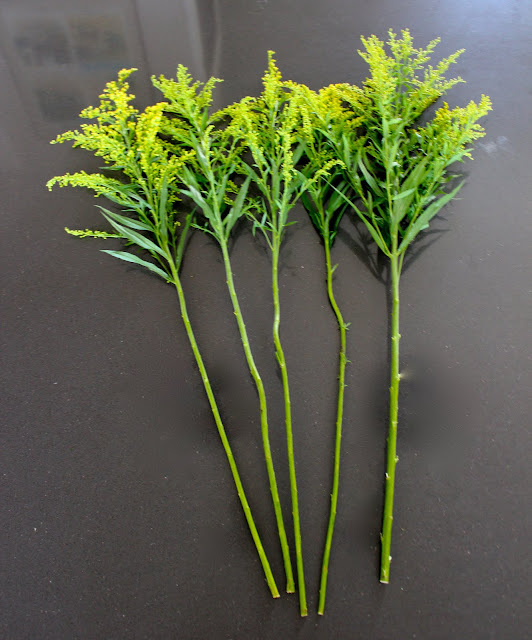 Just change the water every few days and trim the stems if they're getting kind of gluey. Look at you, Ms. Florist! 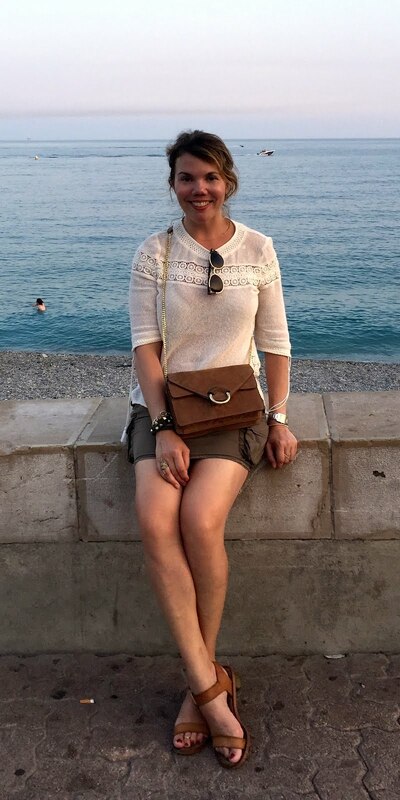 Can I still shop at Zara?